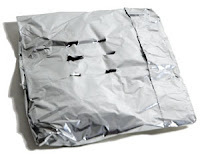 To use your gas grill as a smoker you can either use a smoker box or you can even make a tin foil smoker pouch. This is a great way to extend your grilling possibilities without replacing your gas grill. The smoker pouch is good for one cook and goes right under your grill grate. You can use either barbecue wood pellets or wood chips. This will allow you to use any number of wood flavors available. Here's a tip: if you're using wood pellets you can make several pouches at once and label the wood flavor with a marker. Now you'll always be ready to toss one on your gas grill and smoke! Wood pellets [left] are gaining a lot in popularity and usually available at most grilling supply stores or online via Amazon or bigpoppasmokers.com. These are a great way to sample different wood flavors that are consistent and taste great. Note: you don’t soak wood pellets. Wood chips [right], not to be confused with chunks, can also be used. These come in a wide variety of flavors and are available at most larger grocery stores, barbecue suppliers or online. Wood chips must be soaked for at least an hour before use so they will smolder instead of just burning. Start with a large rectangle of aluminum foil. Add a handful of wood pellets or pre-soaked wood chips. Fold the foil in half and fold over the edges to resembles a pillow. Poke several small holes in the top. Lift up your grill grate and the pouch right under the grate and above the burner. Prepare your grill for indirect grilling and smoke away.